This amazing cleaning tool will eliminate pet hair, lint and other yucky stuff in a matter of seconds, and it's totally safe for use on any surface. It's a large, handheld roller that's totally washable and reusable, and the head is super sticky, so one pass will pick up an incredible amount of debris. Just roll it back and forth to quickly clean floors, clothing, curtains, furniture, bedding or anything else. It'll safely eliminate any grime it encounters, and once the job is done, the roller can be rinsed clean for later use. Simply hold the tool under the faucet, and rinse with regular tap water to release everything collected, then let it dry to use it again. It even comes complete with a slide-on cover to keep it clean when you're not using it. 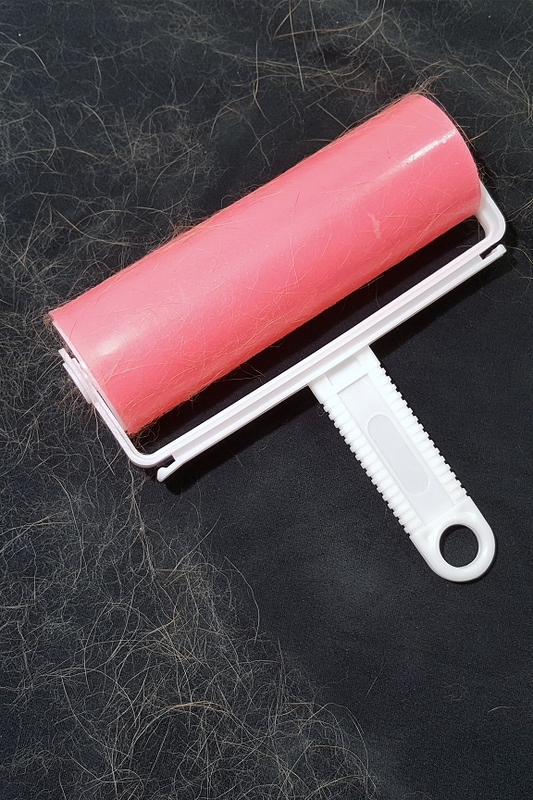 This long-lasting lint and fur remover will remain effective for thousands of uses, and it'll easily outperform more expensive, traditional versions. Thanks to the extra wide roller on this model, you'll be able to clean a larger area in less time, when compared to the regular size roller, so you can easily tackle big jobs, or save time on the small ones. If you like the handle on this tool, but want a smaller roller, then check out our Regular Size Washable Roller. If you like the roller size offered with this model, but wish it had a longer handle, you'll want to take a look at our Large Washable Sticky Roller that comes with a telescopic pole. For those that can't decide, we also sell a 3 roller set and a 2 roller set that include a combination of the most popular sizes for one low price. 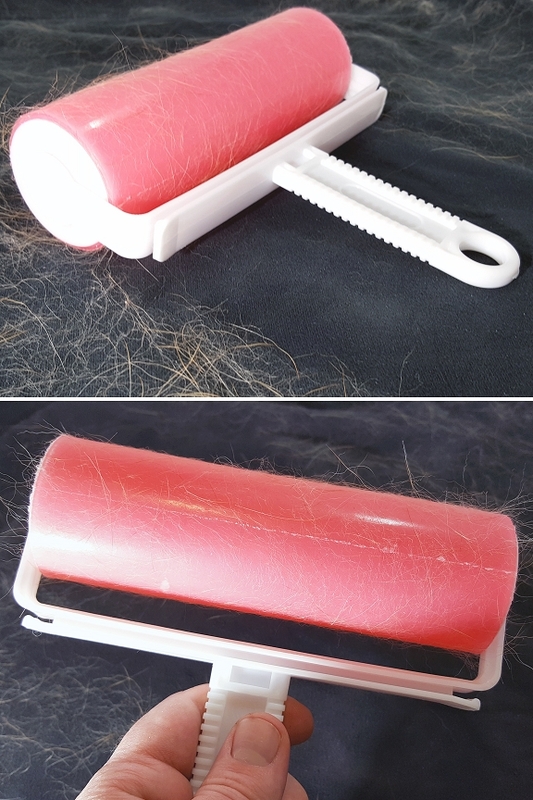 For anyone that is only looking for a portable tool for combating lint and fur on the go, our travel size roller is the perfect choice. Extra-Wide. With a compact handle, and a roller that is much larger than our regular-size model, this tool can cover a large amount of surface in a short amount of time. Quickly clean bigger areas, or collect more lint and hair without rinsing. Super Sticky. Incredible stickiness allows you to clean with little effort. Just glide over debris like dust, lint and fur, and it will instantly transfer to the roller to leave the surface clean. Washable and Reusable. Just rinse with regular tap water to release the stuff you pick up. Once clean, you can use it over again to pick up more stuff. Use the same roller thousands of times without any refills, or re-buys necessary. Long-Lasting. A single roller will last for years, even with daily use. Just rinse off debris, or thoroughly clean with soap and water. The roller is not coated with anything that will wear out. The material itself is sticky by nature, so it will continue to work for a very long time. Increase longevity even more by using the storage sheath that's included. Fast and Efficient. Speed through cleaning with this easy-to-use tool. Remove lint from clothing in a few seconds, or take the fur off your pet's bed in under a minute. Just roll. High Quality. Other options are not as sticky, or they feature rollers that are not as thick. This one is guaranteed to work well and last for years thanks to the higher quality materials and improved construction when compared to other versions available that are similar. Storage Cover Included. Keep the roller clean when not in use, and it will always be ready when you need it. Just slip the sleeve on after rinsing, and it will allow enough airflow for the roller to dry. Store in a drawer or closet without worrying if it will get dirty. Totally safe for use on any surface, and highly effective at lifting up and locking in a wide variety of debris. Use it on the stuff in the list below, or anything similar. This powerful lint and fur remover is incredibly easy to use, and the simple operation combines with the super sticky surface to guarantee good results. Although it's simple to use, and anyone can clean surfaces in seconds when using it, you'll want to follow the instructions and tips below to ensure maximum longevity, and ideal performance. 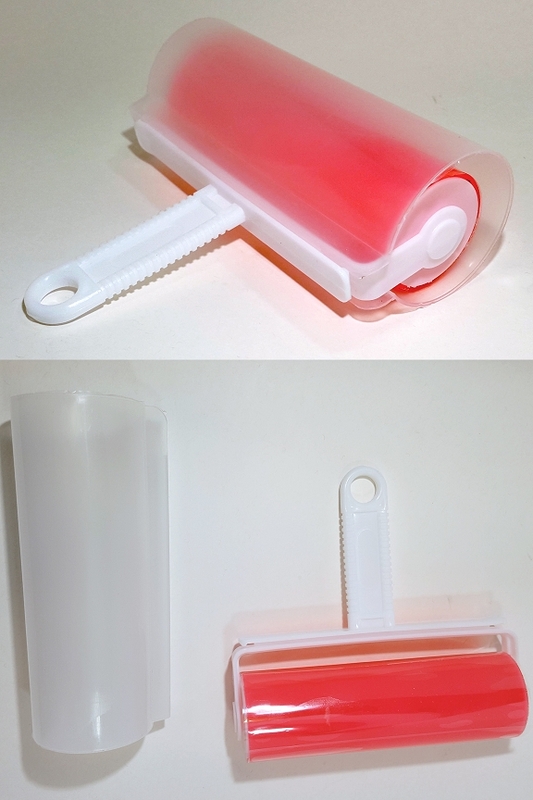 Prepare for use by inspecting the roller, and removing the cover. Slide the sleeve off to reveal the sticky roller, and make sure it is clean and dry before use. Safe for any material, just press down lightly, and roll back and forth to begin cleaning. Rinse under warm water to release what you have collected, then allow to dry for later use. PLEASE NOTE: Drying time is short, and you can reuse almost immediately when necessary because the roller does not absorb the moisture. It is only topical. When dirty from use over time, or when no longer sticky, wash thoroughly with dish soap and water, or rubbing alcohol to rejuvenate and make it sticky again. Store in a location that allows it to stay clean when not in use. Use slide-on cover to make it easy. Overall Dimensions 7" x 7" x 2.25"
Protective Cover Yes. Slide on sleeve offers protection when not in use. Washable Yes. Just rinse off debris to use over and over again. Reusable Yes. Get thousands of uses before replacement is necessary. Uses Quickly pick up any light debris. Perfect for lint, fur, hair, litter, dirt, dust and more. Safe for any surface! A convenient way to keep surfaces clean. Never buy refills again. 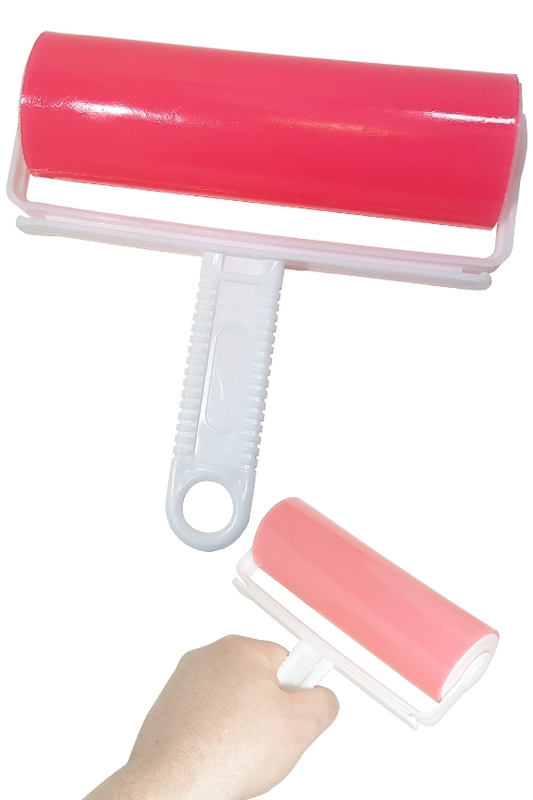 This roller is super sticky and long lasting thanks to the washable and reusable material. Order Yours Today!